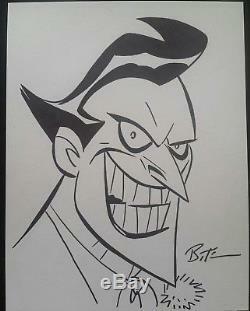 Original sketch of the Joker by Bruce Timm. Sketch is obtained at San Diego 2017 and measures approximately 9" x 12". PLEASE CHECK OUT OUR OTHER AUCTIONS FOR MORE CGC SIGNATURE SERIES BOOKS. WE OFTEN OBTAIN MULTIPLE COPIES OF THE SAME BOOK SIGNED BY THE SAME PEOPLE AND IN THE SAME GRADE. THE IMAGE SHOWN IS FOR REFERENCE ONLY. IF YOU HAVE ANY QUESTIONS ABOUT THIS PLEASE LET US KNOW. The item "Joker sketch by Bruce Timm Batman the Animated Series style SDCC 2017" is in sale since Sunday, May 27, 2018. This item is in the category "Collectibles\Comics\Original Comic Art\Drawings, Sketches". The seller is "badwolfcomic" and is located in Saraland, Alabama. This item can be shipped to United States, Canada, United Kingdom, Denmark, Romania, Slovakia, Bulgaria, Czech republic, Finland, Hungary, Latvia, Lithuania, Malta, Estonia, Australia, Greece, Portugal, Cyprus, Slovenia, Japan, China, Sweden, South Korea, Indonesia, Taiwan, South africa, Thailand, Belgium, France, Hong Kong, Ireland, Netherlands, Poland, Spain, Italy, Germany, Austria, Israel, Mexico, New Zealand, Philippines, Singapore, Switzerland, Norway, Saudi arabia, United arab emirates, Qatar, Kuwait, Bahrain, Croatia, Malaysia, Brazil, Chile, Colombia, Costa rica, Panama, Trinidad and tobago, Guatemala, Honduras, Jamaica.